Are you one of those people who goes running to a doctor every time you get a little gas and indigestion, or when you feel a cold coming on? Likely not. But do you know the remedies that are available to you right in your very own kitchen? That's right - prepared to be amazed! Here are four traditional remedies using Ayurvedic spices that can help you with common ailments that tend to pop up. These these tasty spices can become stalwarts of your kitchen as they will also liven up your everyday cooking. Bon appetit! You saw this one coming, didn't you? This warm, aromatic spice can be used fresh or as a dry powder. The dry powder, while more convenient to store, will pack extra heat compared to fresh, so choose based on your own tolerance. 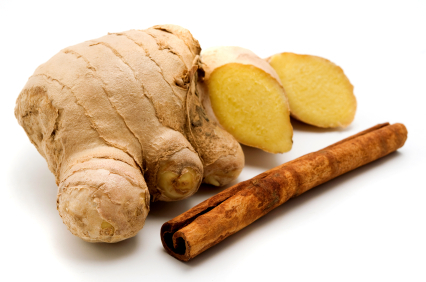 Ginger is great when you have gas or indigestion; it helps clear phlegm and soothe the respiratory system when you're facing a cold, cough, or sore throat; it's a terrific aid for nausea; and it makes a great paste to soothe sore muscles. Fresh ginger slices: Slice or julienne the fresh ginger, add a squirt of lime and a pinch of salt, and enjoy! This will really help the digestion before and after meals. Ginger tea: Shred 5-6cm of ginger root in 2 cups of water. Boil for 5-10 minutes. Strain and allow to cool to drinking temperature. Enjoy with a few drops of lime juice and honey to taste. For a tasty treat, add a few mint leaves and a stick of cinnamon to the boiling water. Ginger paste: Mix ginger powder with room temperature water to the consistency of a paste. Apply topically to sore muscles, allow it to sit for 5-10 minutes, and then wipe away with room temperature water. Note: You may get a little temporary redness at the site of the paste from the heat of the ginger. This sweet and spicy bark is a favourite in desserts as well as savoury dishes. Its uses for health benefits are also numerous and varied. Cinnamon is traditionally said to help resolve gas and indigestion; support healthy weight, blood pressure and cholesterol levels; boost the immune system to fight oncoming coughs and colds; and alleviate cramps from menstruation. Cinnamon tea: Add 1 cup boiling water to ½-1 tsp of cinnamon powder. Steep for 10 minutes. Once it cools to drinking temperature, add 1 tsp of honey and drink. For extra benefit, instead of plain boiling water, add one cup of the strained ginger tea mentioned in the previous section. Cinnamon powder: Take ½ tsp cinnamon powder sprinkled on your food. The list of benefits from this traditional spice used in curries and much more seems almost unending: Supporting the immune system, digestive system and liver, the heart and blood, the joints, and the nervous system. Research being done on turmeric indicate this popular yellow spice may be beneficial for a variety of illnesses including Alzheimer’s, cancer, osteoarthritis, and heart disease. Cook with turmeric: Turmeric can be thrown in a variety of foods — from veggies to rice stir fry to quinoa. Turmeric milk: To soothe a sore throat, boil ½ tsp of turmeric powder in 1 cup of milk. When it cools to drinking temperature, add honey to taste. Turmeric paste: Mix turmeric powder with room temperature water and apply to acne prone skin or sore joints. Just be sure to take care, as it may stain your skin and clothes yellow). For sore joints and muscles, you can even combine with ginger powder as described above, and then follow the paste treatment with a warm bath to which you’ve added 1 cup of baking soda. Turmeric tea: Add ¼ tsp of turmeric powder to 1.5 cups of water and simmer for 10 minutes. Once cooled to drinking temperature, add honey to taste. This is a great way to incorporate the many benefits of turmeric into your daily diet and to promote great digestion. It's actually divine. This sweet and aromatic spice adds a great flavor and packs in antioxidant and anti-inflammatory benefits. The whole plant, including the bulb, stalk, leaves, and seeds can be consumed. Fennel seeds particularly are used in Ayurveda to support healthy digestion, reduce flatulence, and maintain a healthy urinary tract; studies have even shown fennel extract to potentially have anti-cancer properties. Chop fresh fennel (bulb, stalk and leaves) and sauté as part of a green vegetable dish. Add other veggies to your liking. Lightly dry roast the fennel seeds in a pan and chew a handful after each meal for digestion and much more. Add 1 tsp fennel seeds to 1.5 cups of water and simmer for 10 minutes. Drink as a tea to get the digestive as well as anti-inflammatory benefits. Now go on, and stock up on these highly beneficial spices. They'll come in handy far more often than you think!